This month we're writing the world at 49th Shelf, talking books with international themes and settings, about global issues, and travel. From our amazing list of Most Anticipated Books for Spring 2015, we've culled a few that fall under this umbrella that the globally minded among you should seek out to read. About the book: In the small village of Kravan in rural Thailand, the food is like no other in the world. The diet is finely attuned to the land, taking advantage of what is local and plentiful. Made primarily of fresh, foraged vegetables infused with the dominant Khmer flavours of bird chilies, garlic, shallots, and fish sauce, the cuisine is completely distinct from the dishes typically associated with Thailand. 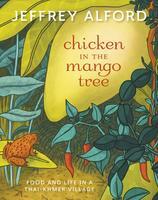 Chicken in the Mango Tree follows the cycle of a year in Kravan, and the recipes associated with each season—steamed tilapia during the rainy season, mushroom soup, called tom yam het, during the cold season, rice noodles with seafood during the hot months and spicy green papaya salad as comfort food all year round. With helpful substitutes for the more exotic ingredients and cooking methods, Alford's recipes and stories blend together to bring a taste of this little-known region to North American homes. Why we're taking note: Alford, with Naomi Duguid, is already an award-winning cookbook author (books including Hot Sour Salty Sweet, Seductions of Rice and HomeBaking), a celebrated food writer, and we're excited to learn more the unique food culture of Kravan and its implications for local eating here in Canada. About the book: Rosalind Chan is a world-renowned cake decorator who has traveled the globe to bring these 14 cakes inspired by the countries and flowers of the places she's visited. Japan, Thailand, China, Indonesia, the Philippines, Russia, Australia, the US and Canada all feature here, each with a beautiful cake and a story to tell. This is a book well suited to intermediate and advanced cake bakers, but it has enough how-to photos and tips on tools and basics that beginners can follow along with ease. The featured cakes teach some of the most sought-after skills in cake making, from the perfect fondant and simple piping to how to mold a silicone head or make edible cake glue to hold your most exotic creations together. 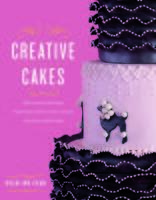 Creative Cakes also contains well-loved cake and confectionery recipes such as Red Velvet, Devils Food Cake, macarons, and marzipan. If you are ready to build your own wedding cake, or advance your skills, or simply learn how to make edible flowers, you will find your know-how in Creative Cakes from East to West. Why we're taking note: Around the world in 14 cakes is the best idea ever. Look forward to a gallery of images from Rosalind Chan's book coming on our blog this week. About the book: At the height of the African AIDS crisis older women mobilized across two continents and an ocean of difference to change the lives of innumerable African women confronting insecurity, violence, grief, and illness. In 2006 the Stephen Lewis Foundation launched its Grandmothers to Grandmothers Campaign, seeking to organize Canadians in solidarity with "Africa's grandmothers"—older caregivers who had lost their children to AIDS and were left to raise their grandchildren. Four years later, some 10,000 Canadians had joined the campaign. May Chazan's The Grandmothers' Movement explores the encounters, ideas, and circumstances that shaped this remarkable story of solidarity and struggle. Based on interviews, family trees, personal journals, and archival materials, Chazan provides the first analysis of the movement. Through personal reflections and powerful vignettes from nearly a decade of participation in grandmothers' lives in South Africa and Canada, she presents untold narratives and brings new humanity to the AIDS crisis in Africa. The Grandmothers' Movement tells a story of hope while challenging conventional understandings of the global AIDS response, solidarity, and old age. It is about the power of older women to alter their own lives through collective action and about the influence of transnational cooperation to effect positive global change. Why we're taking note: International Women's Day was this past weekend, and we're particularly keen about this book by celebrated scholar Chazen which outlines the ways in which women—in particular the oft-overlooked elder demographic—are changing the world. About the book: When acclaimed author Deni Béchard learned of the last living bonobos—matriarchal great apes which are, alongside chimpanzees, our closest relatives—he was astonished. How could we accept the disappearance of this majestic species, along with the rainforest it calls home? Determined not to sit by and do nothing, Béchard began investigating the problems facing the bonobos—industrial and urban encroachment, aggressive resource extraction by foreign companies, the civil war and genocide which had wreaked havoc on the Congo intermittently for more than a century, the trade in bush-meat—and in the process discovered one small organization, the Bonobo Conservation Institute, which had done more to save the bonobos than many much larger organizations. In BCI Béchard recognized a unique post-colonial model for conservation initiatives which, if replicated, might provide one of the only hopes for making the world a far better and more equitable place. Part polemic, part travelogue, part natural history, Bonobo Inc. offers a moving story of how a few committed people can affect great and lasting change, suggests how the rest of us might go about emulating them. Why we're taking note: Béchard is author of the novel Vandal Love, which won the Commonwealth Writer's Prize in 2007. This new book is based on his travels in the Congo and hundreds of interviews, and offers answers to some of the most pressing questions of today. About the book: In 2008, a small-scale flour miller from British Columbia's Sunshine Coast created a handmade bike mill to attract a dedicated farmers' market following. Chris Hergesheimer wanted to challenge the belief that there is only one way—the big way—to grow, process and market grain and flour. For Chris and his family, it wasn't about profit, but connecting a community to its food producers for better health, lower impact on the environment, and the kind of flapjacks only fresh-milled flour can make. But Chris Hergesheimer and his brother Josh could not have predicted that this unique contraption would take them on the journey of their lives. Committed to their cause, and believing in its value despite the dismal economic outlook, the Hergesheimer brothers follow their passion for local on a transcontinental journey. From the rainforests of Roberts Creek, BC, to the bustling streets of Kampala, Uganda, and finally onwards to the village of Panlang in the northwestern corner of South Sudan, The Flour Peddler is the story of two community-minded entrepreneurs as they set out to build and deliver their bicycle-powered grain mill to a rural women's cooperative in a tiny village. Chris and Josh come face to face with the realities of life in South Sudan when war breaks out and their microcapitalism mission becomes a race to leave the country before violence makes escape impossible. About the book: As the Egyptian revolution gained momentum in the winter of 2011, a common refrain echoed across Cairo's Tahrir Square: “The wall of fear came down!” Mass protests against fear and authoritarianism have also rumbled across the aggrieved streets and plazas of Tunis, Athens, Madrid, New York City, Istanbul, Rio de Janeiro, Mexico City, Delhi, and beyond. While the scale of these new uprisings may be unprecedented, the refusal of fear is not unique to our time. 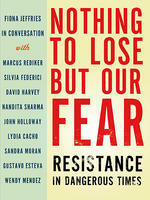 Nothing to Lose but Our Fear brings together an international group of scholars and activists and asks them how can we think critically and act productively in a world awash in fear. Their conversations with Fiona Jeffries provoke consideration of the often hidden histories of people's emancipatory practices and offer reflections that can help us understand the conjuncture of systemic fear and resistance. Why we're taking note: Has the world ever been in more dire need of a book that, in the words of writer Joanna Bourke, is "stimulant for hope"? She elaborates: "Passionate, positive, and practical, it suggests new ways to change our world." About the book: For one woman, the allure of a multiday hike on a "congenial trail" becomes as shrouded as the soggy temperate rainforest she was so unprepared for. After 37 years of marriage, another woman prepares for her return trip to Africa: vaccination boosters, nausea pills and lots and lots of condoms. A 17-hour journey by car through the Great Lakes region of Ontario leads another to dreamlike reflections on the travels of her Anishinaabe grandmothers and the ever-present "fear, worry" she experiences today. In another story, a woman poignantly searches for what many seek on solo journeys—inspiration, renewal, discovery—by returning to Paris only a few years after the painful dissolution of her marriage. But the grey February, a body in pain and the funeral of Mavis Gallant offer a different insight. With new work from both emerging and award-winning authors including Yvonne Blomer, Jane Eaton Hamilton, Waaseyaa'sin Christine Sy, Catherine Owen, Karen Lee and more, these stories explore the unexpected blessings and soul-searching that aloneness offers: clarity, liberation, danger, misery, adventure, devastation and joy. Why we're taking note: We've already been celebrating books about intrepid women travellers this month. Here's another book we must add to the list. About the book: One thousand years ago, a civilization existed in Spain that was famed throughout Europe. To the horror of the Christian rulers to the north, Jews, Christians, and Moors lived together in harmony—and in doing so they created one of the most extraordinary societies the West has ever known. In the span a few hundred years, however, Spain would transform itself from a pluralistic, multicultural society to the least tolerant nation in Europe. By the end of the 15th century, the Spanish Inquisition had established a reign of terror, and the Jews were expelled from the land they had inhabited for 1,500 years. Eventually the Moors, or Arabs, were banned as well. The tragic configuration of events that turned a culture of tolerance into an autocratic police state was effectively repeated centuries later in Nazi Germany, in Occupied France, and even in places closer to home. From Tolerance to Tyranny is a gripping tale of a long-ago era whose familiar echoes continue to resound today. Paris tackles the subject of majority-minority relations in mixed societies, focusing on the humanity of the players even as she exposes the pitfalls of their ideals. Why we're taking note: This book is a revised reissue of award-winning non-fiction writer Paris's 1995 book, End of Days. In our current cultural climate, with multicultural values under threat coming from religious extremists of all stripes, the themes and lessons explored in From Tolerance to Tyranny are more relevant than ever. About the book: Svetlana Stalina, who died on November 22, 2011, at the age of 85, was the only daughter and the last surviving child of Josef Stalin. Beyond Stalina's controversial defection to the US in a cloak-and-dagger escape via India in 1967, her journey from life as the beloved daughter of a fierce autocrat to death in small-town Wisconsin is an astonishing saga. Publicly she was the young darling of her people; privately she was controlled by a tyrannical father who dictated her every move, even sentencing a man she loved to ten years' hard labour in Siberia. Svetlana burned her passport soon after her arrival in New York City and renounced both her father and the USSR. She married four times and had three children. Her last husband was William Wesley Peters, architect Frank Lloyd Wright's chief apprentice, with whom she lived at Taliesin West, Wright's desert compound in Arizona. In 1984, she returned to the Soviet Union, this time renouncing the US, and then reappeared in America two years later, claiming she had been manipulated by her homeland. She spoke four languages and was politically shrewd, even warning in the late '90s of the consequences of the rise to power of former KGB officer Vladimir Putin. A woman shaped and torn apart by her father's legacy, Svetlana Stalina spent her final years as a nomad, shuttling between England, France and the US. Why we're taking note: Sullivan is one of Canada's most acclaimed biographers, a Governor-General's Award-winner. We're looking forward to her first book since Villa Air-Bel, which won the The Canadian Society for Yad Vashem Award in Holocaust History and the Helen and Stan Vine Annual Canadian Jewish Book Awards in 2007. She couldn't have chosen a subject more fascinating to consider. About the book: Like any new mother, Emily is thrilled when her first child, a daughter, is born. The baby, Sadie, is healthy and stunningly beautiful, with snow white hair and fair skin. Even the doctors and nurses can’t help a second look at this magical child. But soon a darker current begins to emerge—something is amiss. After three months of testing, Sadie is diagnosed with albinism, a rare genetic condition. Emily, a folklore scholar and an award-winning journalist, is accustomed to understanding and processing the world through stories. With Sadie at her side, Emily researches the cultural beliefs surrounding albinism and finds a curious history of outlandish tales of magic, and of good and evil reaching back through time, along with present-day atrocities. In some parts of the world, people with albinism are stalked; their condition is seen to bring luck and health as well as danger and death. Investigating the different reactions, in different cultures, to those with albinism, Emily begins to see her child as a connection between worlds. Why we're taking note: Urquhart's book has been receiving huge buzz, appearing on most lists as one to watch this spring. Its blend of parenting memoir, sociological treatise and scholarly work promises to be extraordinary.